"First Pakistani Gender Equality Mt.Everest (8848m) Expedition"
It is the mission of our Mt.Everest Expedition to embark the FIRST female Pakistani on any 8000er summit. Samina & Mirza are the only Pakistani to carry Pakistan´s National Flag to Mt.Everst on the 60th anniversary of its first ascent back in 1953. A mountain climbing venture of a Pakistani brother & sister. Miza Ali and Samina Baig are natives of Shimshal Valley deep in the extreme Karakorum range in Upper Hunza. 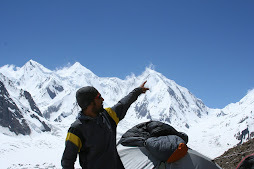 Mirza (29 years) has been climbing for last 12 years and wokrs as a mountain guide, expedition leader and trainer in the Karakorum, Himalaya and Hindukush. Samina Baig (22 years) is a student of arts and has been climbing since four years. Her goal is to turn her love for mountaineering into her profession and work as a tour leader and mountain guide in the near future. Samina is the first pakistani female to attempt any 8000er mountain. Especially Mt. Everest, the highest peak of them all, has been summited only by two Pakistani mountaineers: Mr. Nazir Sabir & Mr. Hassan Sadpara. Samina could become the first Pakistani female to summit Mt.Evererest. we are extremely delighted to announce that our Mt.Everest Expedition has been in its final phase. The expeditions we are launching are not to gain highest merrits or only to reach the highest summits but the aim of our mountaineering adventures is for the sake of encouraging the youth for outdoor sports, ecological awarness and empowering women in mountain adventures and related sports. In the past four years we have successfully organized several expeditions. Our Mt.Everest expedition project is the follow up of our mission to encourage women and give them equal rights, this adventure story is about a brother and his sister, how he encourges his sister to emancipate in the society of the worlds most demanding sport: "Mountain Climbing"
Since Mt.Everest is NOt an easy task or easy mountain to attempt nor its offordable for the average person, we are very much thankful to our very GENROUS KIWI FRIENDS & YOUNG GRASSHOPPER, "the guiders" http://www.younggrasshopper.com/ those who believe in our mission and support us, we would like to THANK YOU FOR THE GREAT FINANCIAL SUPPORT from the core of our hearts! Our Mt.Everest expedition starts from 1st of April till 6th of June 2013. You can follow us on our expedition right here on this page! At 8,850 m, Mount Everest straddles the border between Nepal and Tibet, in the great Himalaya Range. our mission is to climb Mount Everest via the south east ridge, which is the original route taken by Sir Edmund Hillary and Tenzing Norgay when they were the first people to climb the mountain in 1953.
we will be climbing Everest with a team of Sherpas whom I have met previously during my Manaslu Expedition Automn 2012 Dawa sherpa would be the team leader, Our expedition has been booked with Seven summit treks. After spending a few days in Kathmandu, the capital city of Nepal, our expedition will fly to the small mountain village of Lukla (2,860 m), from where we will depart and spend 10 days trekking through the mountains to Everest Base Camp (5,360 m). Along the way, we will pass through Namche Bazaar, a small town which is the main trading centre in the Everest Region, and which is known as the gateway to the 'High Himalaya'. The route between base camp and Camp 1 (6,100 m) involves passage through the infamous Khumbu Icefall, a dangerous river of ice which cascades down into the valley where base camp is located. Above Camp 1, we will make our way up the Western Cwm (pronounced 'koom') to the base of the Lhotse face, where we will establish Camp 2 (6,500 m). The Western Cwm is a relatively flat, gently rising glacial valley, marked by huge lateral crevasses in the centre. With little atmosphere to filter the sun and reflective snow covering everything, the area can quickly turn into an oven on a clear, windless day, in spite of the extreme altitude. From Camp 2, we will ascend the Lhotse face on fixed ropes to Camp 3, located on a small ledge at 7,400 m, and move on to Camp 4, located on the South Col at 8,000 m, from where we will launch our summit attempt. Success and failur is in the hands of Almighty, though our struggle is something to do different ,show positive side of pakistan, and unique give chance for females to explore the unknown, bring change, break the barriers,break the chains ,conqure the hights ,find the new vista's,reach the goals ,motivate & give awareness and empower women, this is the main aim of our Expedition. we want each of you those who visit our Website please keep us in your prayers and pray for our Success to put Green Flag on top of the world and safe return! This would surely be of prime interest this spring. Finally we are able to see a Pakistani lady fighting 8000er slopes. All the best Ali and Samina. I really wish that you two return home safe and successful with a bunch of records under your belt. Hope to see the program finalized soon. What an amazing feat and such an inspiration to all Pakistani women!....I'm on my way to buy some snow boots. Heartiest Congratulation to both of you my brother et sister. Am particularly thankful to the Kiwi friends who helped us all to climb you both on the Everest. The youth and people of GB is proud of you!Pakistan is proud of you! Hunza is Proud of you!Muslim Ummah is proud of you!The Ismaili Community is proud of you! Dear Samina & Mirza, My heartiest congratulations to you and Samina for your brilliant successs. We wish you a safe return. it is great achievement for whole nation and specially to ismaili community and role model to eliminate gender differences. Mashallah! Congrats guys. I'm just an armchair climber (poring over sat maps :) second gen from pak in the US but you kids are so inspiring! Inshallah one day I will at least get to Base Camp! I'm really happy for Samina, for Mirza and for your family ... and Pakistan. I remember all of you always with love. a warm greeting to all of you and also to Faiz and his family.